At GenCon 2016, I got a surprisingly high number of small games. While I am still trying to keep to our usual once-a-day posting schedule, I am going to combine some of these games together as some of the mini-games lead to mini-reviews. Today, I have two games from the good Dr. Knizia, a solitaire puzzle game on one hand and a reprint of a classic two player duel on the other. 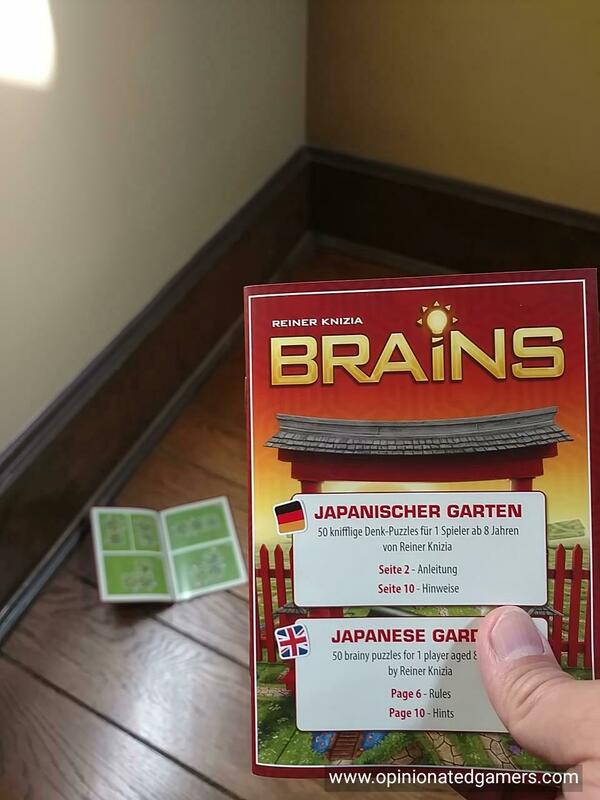 Brains is a new puzzle/game from Dr. Reiner Knizia. 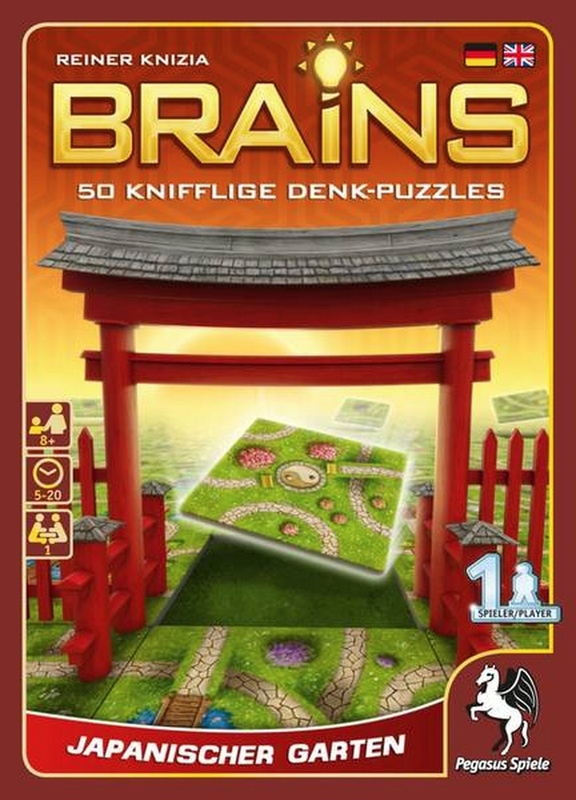 This game is set in a Japanese Garden – and a brief search on Google shows that there are multiple Japanese Gardens in Germany and Austria, the largest of which is in Kaiserslautern. In any event, in this game, the player will try to arrange up to 7 tiles on a puzzle board following the rules/restrictions given on that board. There are 50 different puzzles included in the game, 5 tiers of difficulty with 10 puzzles in each. The puzzles themselves are grids of anywhere from 1 to 6 tile spaces. You have seven possible tiles to use to solve each puzzle. 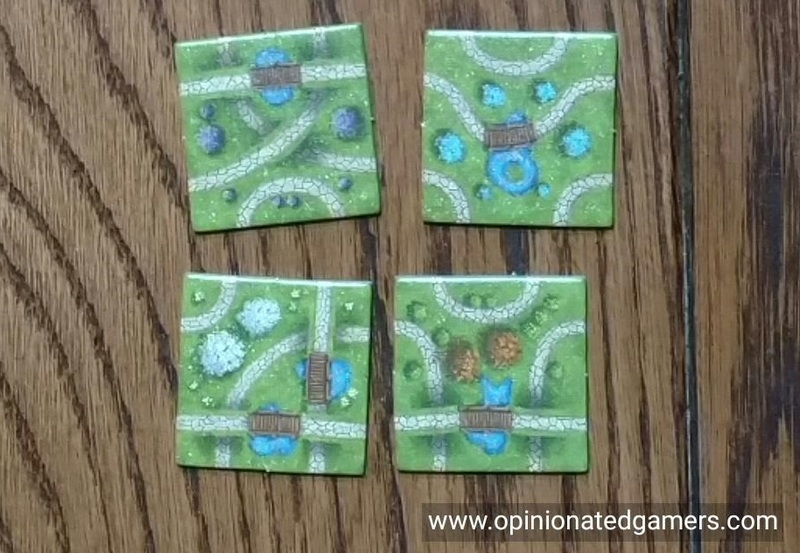 Each of the tiles has a number of different paths represented on them, and you will place them on the board according to the rules for each puzzle – these are found on the exterior of the tile space on the puzzle board. Any path with a green number on it must traverse over exactly that number of different tiles – the same tile can be counted multiple times if the path leaves it and comes back later. There is no time limit to solving the puzzles, you simply manipulate the tiles until you have met all the criteria for the puzzle. In general, you should be able to see that the puzzle is solved correctly, but in case you are not sure – there is an answer book available that has a diagram of the correct tile alignment. Per the rules, there is a unique solution to each of the puzzles in the box. Additionally, if you get stuck along the way, there is a separate book with hints – each puzzle has a single hint available. This hint is in the form of diagram of the puzzle with a single tile placed in the correct place and orientation. The puzzle itself is fairly challenging. I ran through the first twenty puzzles in about 45 minutes, but now that I’m in the third tier of difficulty, the puzzles are taking up to 5 minutes each. At the time that I write this – I am on puzzle 36, and I have very much enjoyed the solitaire activity. Though I haven’t done it myself (as I have the real game) – the box also advertises apps for iPhone/Android as well so that you can play the game on your phone. As there are only 6 tiles at most in a puzzle, this sort of thing should fit perfectly on a phone screen. This would also prove to be an amusing diversion on a road trip or perhaps on your daily commute. As I have not downloaded the app, I cannot tell you if the puzzles are the same or not but looking at the description on Google Play, there are only 40 puzzles advertised that use up to 5 tiles. This might mean that you get the first 40 puzzles that are in the box, and not the final 10. At GenCon, I was at the IELLO booth and heard a few gamers talking about the awesome new reprint of Battle Line. Of course, the new version is called Schotten Totten, which is in fact the name of the original game which Battle Line was based on. Per Larry Levy: “The game is played with a 54 card deck consisting of six suits composed of cards numbered 1 through 9. 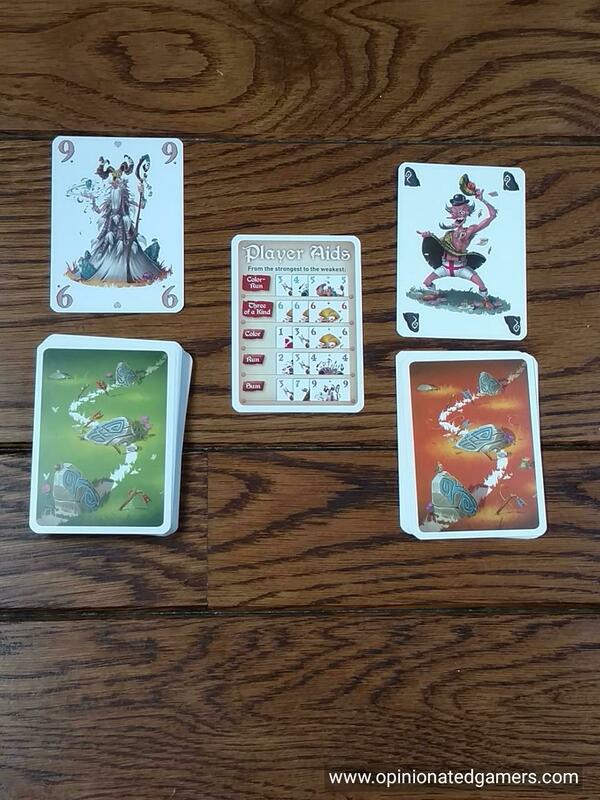 There are also nine boundary-stone cards, which are the objectives of the contest. I’ll refer to these henceforth as stones. At the beginning of the game, the nine stones are laid out in a horizontal row between the players. 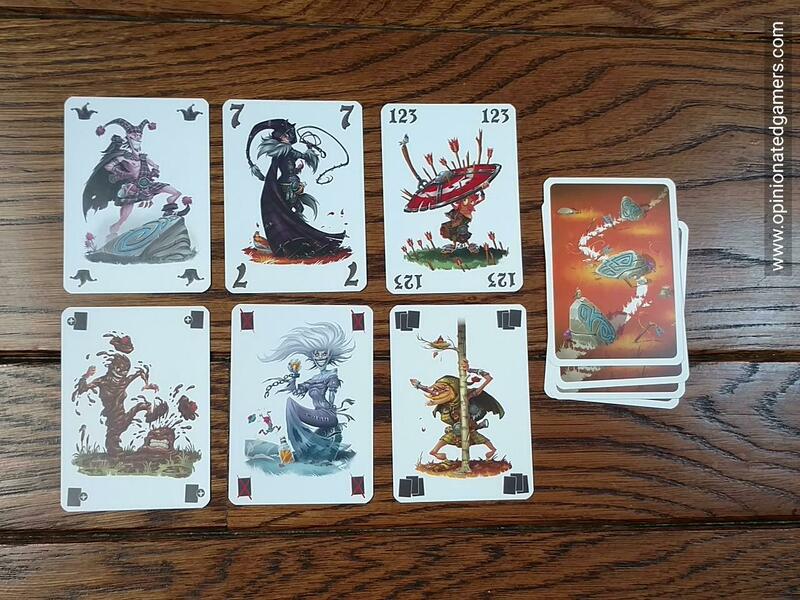 Each player receives six cards to make up his beginning hand. Players alternate turns. During his turn, a player selects one of his cards and places it face up on his side of one of the stones. He then ends his turn by drawing a card from the deck. When the deck is depleted, players continue taking their turns without drawing any cards. Most likely, the game will end before this occurs. If two hands have the same rank, add up the values of the three cards. The hand with the higher total wins. If this sum is the same, the player who completed his hand first wins. This version of the game also includes a deck of 10 Tactic cards which can be used to play the game in a variant fashion. 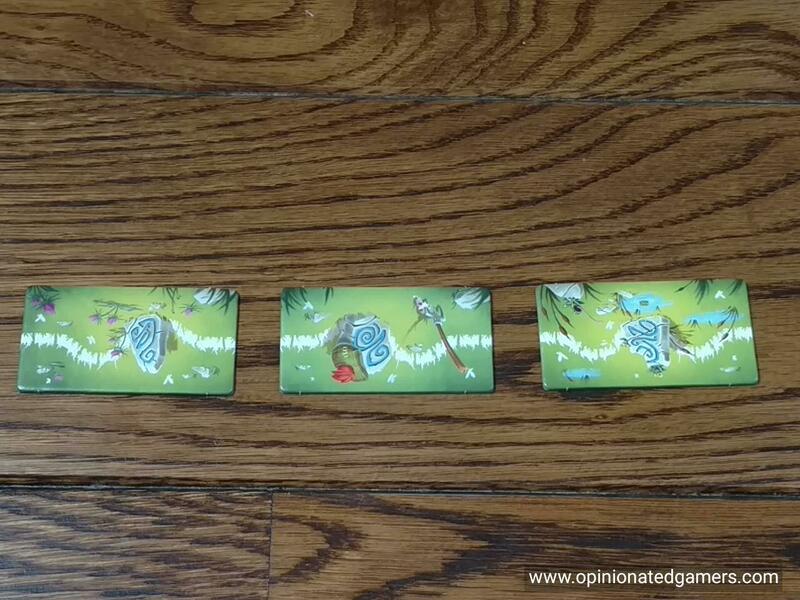 The Tactic cards are shuffled and placed in their own deck. 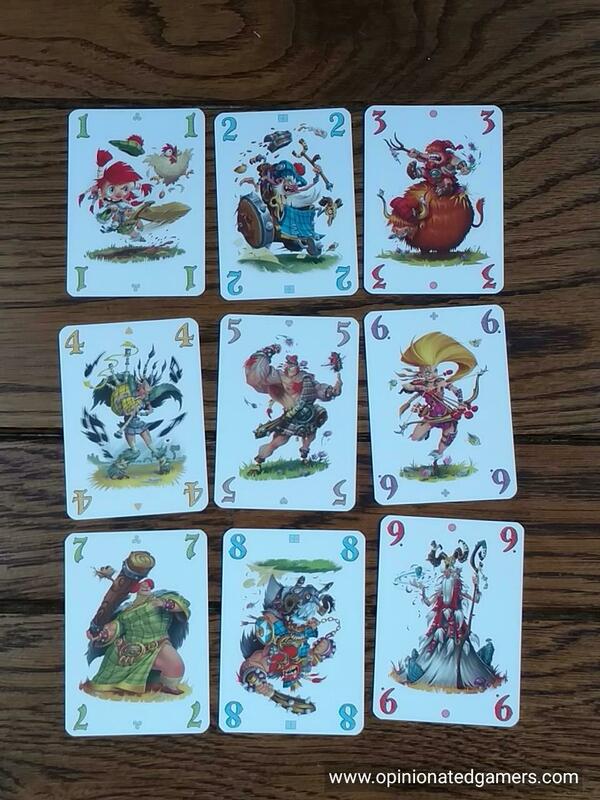 At the start of the game, players draw 7 Clan cards from the deck (instead of 6). On every turn in the game, after playing a card, players can choose to draw either a Clan card or a Tactic card. Tactic cards are played to the board on your turn (you would not play a Clan card on that turn). However, there is a limit in place that you can not have two more Tactic cards in play than your opponent. If you already have one more in play than your opponent, you simply cannot play another one until your opponent plays one first. Recruiter: Draw 3 cards from one or both decks and add to your hand. Discard 2 cards from your new hand. Larry Levy’s thoughts on the game: The game is a pleasant mix of the studious and the chaotic. With only a six card hand and a new card drawn each turn, it’s impossible to plan very far ahead. The key is to keep your options open as much as possible and to maintain as much flexibility as you can. The rules state this is a tactical card game, and that is indeed the main focus of the contest. Much of the strategy revolves around the fact that the first player who commits to a stone is at a considerable disadvantage. If the card is a low one, you’ve limited how high that hand can be and your opponent can plan accordingly; if the card is a high one, your opponent might give up on the stone and you will have wasted a good card. Committing one card is bad; committing two cards, which basically locks in the type of hand it can be, is worse. Whoever has to commit first on the key stones before he has the cards to ensure victory will probably lose, unless he has overwhelmingly better cards. But while tactics are important, a player who ignores the strategic aspect of this game cannot win. The problem is that you’ll eventually have to commit to a stone sooner or later; knowing where and how to commit is therefore crucial. The center stones give the greatest opportunity for three-in-a-row wins, so they have offensive and defensive importance. Thus if you commit there, you’d better have a very good hand to place there or one which has an excellent chance of being one. (Most stones are won with Straight Flushes or Three of a Kinds; don’t count on a mere Flush winning a center stone.) Early plays are often on stones near the ends, both because you may not have sufficiently good cards to play on the center stones and because you don’t wish to commit (there’s that word again!) yet on the important battleground. Although they usually seem innocuous, the initial plays of a hand set the tone for the contest and are often crucial. One of the clever design touches is the fact that claiming a stone prevents your opponent from playing any further cards there. At almost all times, your hand will consist of cards you are desperately trying to avoid playing (don’t want to commit, trying to maintain flexibility, all that good stuff), as well as cards that you’ve concluded are worthless, primarily based on which cards have already been played. Thus, you’d like to play the latter cards and hang on to the former. The problem is, where to play them? Whatever stone they are played on will likely be lost. Play such cards on the same stone and your opponent can gain a cheap win (probably by using some of *his* lousy cards). Spread them around and you risk giving up too many stones. The proper tactic is to play them on a stone that your opponent has won anyway. If your opponent can claim this stone, he will deprive you of one or two “waste” plays, plays which let you delay playing the cards you don’t want to play. If you can conclude where the lost battles are, you can dump at least one of your waste cards on each of them, which might force your opponent to play a card he’d rather not. Such struggles can often decide the game. The game is full of such nice touches, which gradually emerge after repeated plays, in the manner for which Knizia games are renowned. The basic feel of the game is similar to Reibach & Co.; each play is important and demands consideration, but not brainbusting analysis. Luck clearly plays a role and, on rare occasions, dominates play; but on most hands, it seems that the player who best takes advantage of the cards he draws will win. The gameplay itself is quite unique; although there’s nothing particularly revolutionary about the design, I don’t think I’ve ever played a game quite like it. The end result is quite satisfying, particularly for those who want a game to be involving without being consuming. Knizia scores yet again; now if he can only manage to stay away from those spare rib and sauerkraut meals before retiring at night to dream of new game themes. However, I’ve found over the years, that my stance on the game is seeming in the minority, because every time that I suggest the game, my opponent wants to make sure that I pull out my copy of Battle Line (because it was the first to include the Tactic cards). 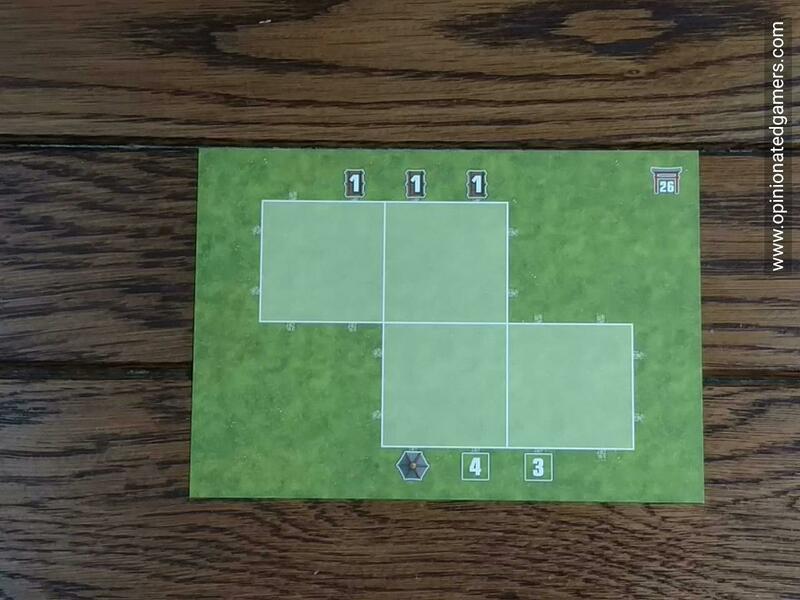 For those of you who like this addition to the game, the Tactic cards here are somewhat different than those in the GMT version, so it might be worth peeking at this one too to see if it hits your sweet spot. The artwork on the cards is pretty sweet though. I do wish that the back of the player aid card had a run down of the icons on the special cards. The icons are fairly easy to figure out – but the cards themselves are text-less, and it would have been nice to have had the extra information on the back of the card. This complaint certainly doesn’t detract from the game overall, and after a few plays, you should be able to remember the different Tactic cards anyways… it’s just a bit more rulebook consulting in the first few games. Back when I first started designing games, I wanted to invent a more strategic version of “War”–the card game in which players just flip over cards from their decks, with the higher card wining the lower one (and a “war” breaking out with every tie). So I started making up a version that included multiple simultaneous battles and waited until 3 cards accumulated at each battle to score them, with the best poker-style hand winning each battle. I was getting excited about the direction this design was taking until I discovered Schotten Totten and realized that someone had already beat me to it! 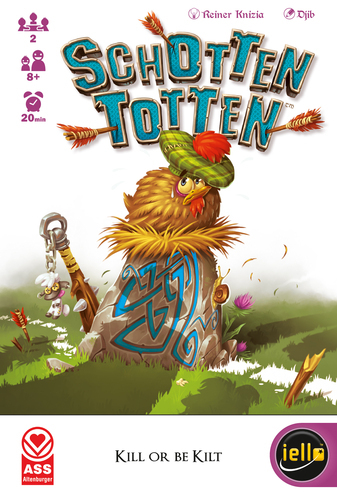 Schotten Totten is a simple, elegant game that I always refer to as “gamer’s War,” because it is still light fun, but actually gives the players the choices and room for tactics that I was searching for back then.